and jellyfish lie marooned in blue heaps, deflating their poison. But why do they still terrify me more than bears? and smile at a couple jogging by. Love cannot be hoarded. licking her fingers before flipping each page. over the horizon’s harsh plank. 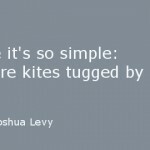 Joshua Levy is an entrepreneur who loves to write. His work has been published in Maisonneuve Magazine, Event, Feathertale, The Caribbean Writer, the Canadian Jewish News, Poetry-Quebec, Shtetl, and three Vehicle Press collections. He is a winner of the 2010 CBC Writing Competition, shortlisted for the 2008 CBC Writing Competition, and was long-listed for the 2012 Montreal International Poetry Prize.